“How To Feed Your Cancer: Dietary Strategies to Keep Cancer at Bay,” a talk by Irminne Van Dyken, M.D., will be presented at 7 p.m. Thursday at the J. Walter Cameron Center in Wailuku. Dr. Van Dyken will discuss lifestyle and dietary strategies to keep cancer at bay. American College of Surgeons, and the first physician on Maui (and first surgeon in Hawaii) to be board certified by the American College of Lifestyle Medicine. She is a member of the American Society of Breast Surgeons, the Society for Endoscopic and Gastrointestinal Surgeons, and the Southwestern Surgical Society. This Vegetarian Society of Hawaii presentation is free; no reservations are necessary. Food will be provided by Down to Earth in Kahului. For more information, call 385-2790, contact jerome.kellner@gmail.com, or visit vsh.org. The J. Walter Cameron Center is at 95 Mahalani St.
Karen Arakawa, manager of Maui County Business Resource Center, will facilitate Maui Business Brainstormers’ February edition of “Business in the Think Tank” from 11:45 a.m. to 2 p.m. Tuesday at the Maui County Business Resource Center at the Maui Mall. Anyone interested in attending any MBB event must become an MBB member and RSVP at www.meetup.com/MauiBusinessBrainstormers. Membership is free. Tuesday’s BiTT session will help attendees focus on implementing their business goals. Business owners trying to grow but facing challenges have the opportunity to present their case to fellow business owners, who, in turn, ask questions and offer insight, ideas and suggestions. Assistants to the guest facilitator are MBB organizers Lori Fisher and Nicole Fisher. The Maui chapter of the Hawaii Bicycling League will host a series of islandwide rides, called Maui Cycling Exploration, led by trained ride leaders beginning Saturday in West Maui. The rides are tentatively scheduled for the second Saturday of each month. Saturday’s ride will be from 8:30 a.m. to 1:30 p.m. beginning at Honokowai Marketplace. It is donation-based, open to both residents and visitors, and capped at 30 participants. Booking is required in advance at mauibike.org. The ride will go through Kapalua to a turnaround point of either Nakalele Blowhole (advanced) or Honolua Bay (intermediate). Round-trip distances will be 25 miles and 17 miles, respectively, and include breaks for scenic stops and lunch. A different bike shop will be featured each month as the sponsor, providing ride support and rental gear for purchase. Interested bike shops can email maui@hbl.org for more information. The ride series is made possible thanks to support from Hawai’i Tourism Authority’s Community Enrichment Program. The Maui Native Hawaiian Chamber of Commerce will welcome Howard Kihune Jr. and Sandra Duvauchelle to make a presentation at its general membership meeting on Tuesday at the Maui Tropical Plantation (Tram Station) in Waikapu. No-host cocktails and networking will begin at 5:30 p.m. The duo will discuss the challenges and rewards of developing affordable/workforce housing on Maui. Founded in collaboration between Howard Kihune Sr. and Howard Kihune Jr., Aina Lani Pacific LLC strives to provide affordable workforce housing to residents. The Aina Lani Pacific presentation will include an overview of the Kaiaulu Maui development, including available floor plans. They will also share plans for Pailolo Place, another 100 percent affordable development in West Maui. Tickets are $25 for members and $30 for nonmembers. Tickets may be purchased at www.mnhcoc.org. For more information, call 281-6438. Mana’olana Pink Paddlers, a support group for all cancer patients, survivors and supporters, is expanding its reach to children who are also recovering from the disease or have been touched by cancer. Mary Dungans, the president of Mana’olana, believes that the success shown with the adults in the program can also benefit young children. Mana’olana has joined forces with the Pacific Cancer Foundation to launch “Kids Making Waves” from 9 a.m. to noon March 2 at Maui Canoe Club, 99 N. Kihei Road in Kihei. Accompanied by club members, the children will search for whales and honu in a double-hulled outrigger canoe. There will be beach games, water blasters and food. The program is designed for ages 8-12, with other adapted activities for children 4-8. Children must be accompanied by a parent or guardian and must bring a life jacket. RSVP to nancy@pacificcancerfoundation.org by Saturday. The annual Maui District Middle Schools’ Massed Band Concert will take place at 6:30 p.m. Saturday at the Maui High School Izumi “Shine” Matsui Athletic Center. Music will be performed by more than 275 young musicians from Iao Intermediate, Kalama Intermediate, Lahaina Intermediate, Lanai High & Elementary, Lokelani Intermediate and Maui Waena Intermediate schools. Admission is free and seating is limited. The Maui Pops Orchestra announces the sixth year of the Auriol Flavell Student Scholarship Awards for Young Musicians. These awards are intended for students who are pursuing higher education in the field of music, who play a symphony orchestra instrument, and who plan to promote community orchestras on Maui or wherever they live in the future. Application forms are available at mauipops.org/scholarship. A written recommendation by a music instructor is required with the completed application form. Applicants will need to state their graduating year of high school or college, and should provide their clearly defined career and music education goals as indicated in the application. Send completed application to Maui Pops Orchestra, 95 Mahalani St., Room 6, Wailuku 96793. All submissions must be received by Feb. 22. The scholarship award will be presented March 10 at the Maui Pops Spring Concert at the Maui Arts & Cultural Center in the Castle Theater. Donations to the scholarship fund may be made payable to Maui Pops Orchestra. The Maui Puerto Rican Association will hold the third workshop of the series La Cocina Boricua (the Puerto Rican Kitchen) from 10 a.m. to noon Saturday at Heritage Hall, 401 Baldwin Ave. in Paia. The series is intended to broaden awareness of the rich diversity of Puerto Rican foods. Chef Migdalia “Mikki” Perricelli, a native of Puerto Rico, will demonstrate making pasteles de olla (pasteles made in a pot). Pasteles, the soul food of Puerto Rico, are popular here in Hawaii and are made with a dough (masa) of green bananas or plaintains and achiote oil, then stuffed with pork, onions, garlic, cilantro and spices. Pasteles are wrapped in banana (or ti) leaves and steamed before being eaten. The cost for the workshop is $15 per person and includes lunch featuring the foods demonstrated. Printed recipes will be distributed. Only 15 persons can be accommodated and reservations are required. For reservations or more information, call 243-0065. The Rotary Club of Kihei Wailea will present its annual fundraising dinner from 5 to 9 p.m. Saturday at Mulligans on the Blue featuring Kaina Kountry. Kathy Collins will serve as emcee. Tickets are $85 per person. For more information, visit mauirotary.org. 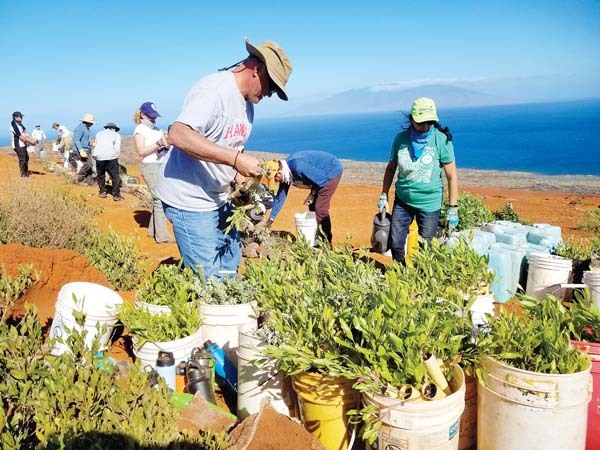 The Friends of Haleakala National Park is seeking volunteers for an overnight service project in Haleakala Crater Feb. 18- 20. The group will hike into the crater and stay free for two nights in Holua Cabin while doing work to protect native plants and nene habitat. In addition to helping the national park, those volunteering will also have some time for hiking, bird-watching, stargazing or photography, as well as enjoyment of the quiet crater wilderness. The park entrance and cabin fees are waived for volunteers doing service work with the Friends of Haleakala National Park. A maximum of 12 persons can be accommodated on each trip. Participants must be physically fit and able to hike in and out of the crater carrying a backpack with their sleeping bag, personal items and a share of the food. To join this trip, first visit and register your readiness at the website www.fhnp.org where more information can be found about the Friends’ mission and work to preserve and protect Haleakala National Park. For a reservation for this trip or a future trip scheduled on the website, send email or call the leader whose contacts are listed on the service trip page. Mark Harbison, a member of Kihei Wailea Rotary Club, will be guest speaker at the noon meeting of the club Wednesday at Mulligan’s on the Blue. He will be speaking on membership. The meeting is open to the pubic; lunch is $15. For more information, email margief1202@yahoo.com. The Maui Outstanding Piano Amateurs Festival will take place at 7 p.m. Saturday at Wailuku Union Church. Admission is free and open to the public. The festival is designed as a forum in the art of the piano for nonprofessional classical musicians. It is presented by the Music at Wailuku Union Church and DFMusicMaui, directed by Damira (Mira) Feldman, an internationally recognized pianist and educator. “It would be a great thing for Maui to be established as a destination for amateur adult pianists from around the world to come together to perform and to share their musical passion with other of like interests and talents,” said Feldman. The 2019 MOPAF showcases the exceptional artistic talent of Maui residents, with guest performances from neighboring islands and around the world — Margaret (Peggy) W. King, Christophe Javon, Noriko Fulmer, Sonia Markh, Yuko Ota, Maurice Sprenger, Niko Nemoto, Mari Yoshihara, Janet Chun and Neve Mazingo. The program features the most celebrated music by Bach, Handel, Couperin, Beethoven, Chopin, Liszt, Mendelssohn, Scriabin and Rachmaninov among others. For more details, contact (305) 588-0083 or DFMusicMaui@gmail.com. University of Hawaii Maui College is offering a training program for individuals ages 18 and older who are interested in learning the fundamentals of dental assisting and dental front office operations to prepare for a new career in dental health care. Through a grant-funded partnership with local nonprofit Hui No Ke Ola Pono, full tuition sponsorship (a $1,200 value) is being offered to Native Hawaiian participants, who will also undergo cultural orientation, financial literacy training, and a 100-hour capstone/service learning project to earn a Certificate of Professional Development. Students will participate in a five-week-long curriculum including lecture, lab exams and clinical rotation that will take place between Feb. 26 and March 29 on Tuesdays and Fridays from 8:30 am to 4:30 p.m. Orientation to the program and completion of prerequisites begins on Feb. 19. To reserve a seat or find out more details, contact edvmaui@hawaii.edu or (808) 984-3231. Space is limited and participants are enrolled on a first-come, first-served basis. The American Association of University Women’s Lunch Bunch will meet at noon Tuesday at Cafe O’Lei at the Dunes, 1333 Maui Lani Parkway in Kahului. RSVP with menu selection to Janet Walker at 874-9435, (530) 409-0192 or bjpwalker@comcast.net. Tickets are available for the American Association of University Women’s annual whale watch cruise from 3 to 5 p.m. March 3 aboard the Pacific Whale Foundation’s Ocean Odyssey. Check-in time will be 2 p.m. in front of the foundation’s Maalaea store. The cruise raises funds for AAUW’s three scholarships. Tickets are $40 each and include pupu and door prizes. During the cruise, naturalists will talk all about whales, and beer and wine will be available at the cash bar. For tickets, contact Pat Gotschalk at 868-0418 or pagotschalk@gmail.com. Cash donations for the scholarship fund are welcome. Checks should be made out to AAUW-Maui Branch.